As users get wiser to phishing scams, so the scammers are producing cons that are ever more complex – like the very genuine-looking Apple Support scam that's doing the rounds, as reported by security expert Brian Krebs. 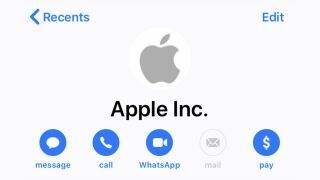 What happens is you get an automated call that appears to come from Apple itself: the logo, the address, and the phone number all appear to check out. The call warns about a data breach at the company and then asks users to get in touch – via a different number – to protect their Apple IDs before doing anything else. When the scammer's phone number is called, it reaches what seems to be a foreign call center. Krebs tried ringing it and was put on hold before being disconnected, so it's not clear exactly what the scam is supposed to be. While details are thin on the ground at the moment as to the purpose of the phishing attack, we do at least know what it looks like. Be wary of any calls you get out of the blue that appear to be from Apple Support. As with any suspected phishing attempt, whether it's over email or the phone, don't follow any embedded links or numbers. Instead, contact the company involved directly using the official numbers listed on its website – in this case, if you rang Apple Support, they would be able to confirm they hadn't been in touch and your Apple ID was fine. Scammers continue to use a variety of tricks to try and get people to part with personal information or to install something that they really shouldn't. To help minimize the risk, keep all your apps and devices up to date with the latest security patches.